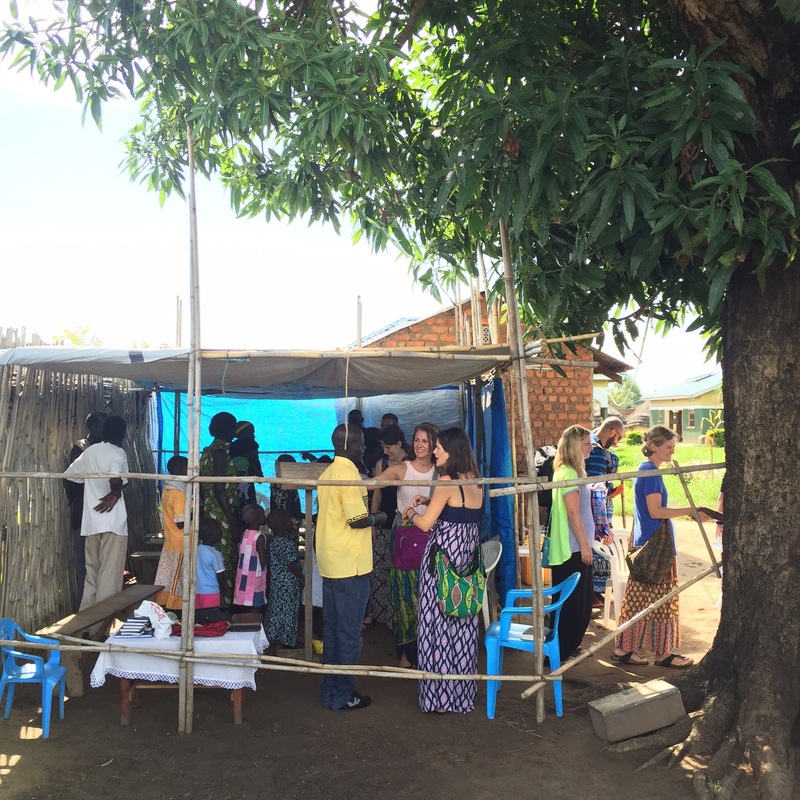 A little while ago, I wrote about my experience attending a tree church in South Sudan over on Seed Effect’s blog. I’m finally getting around to posting it: you can read the story at this link or below. Sunday morning, we pile into two SUVs and drive down the bumpy dirt roads of Kajo Keji to attend a church beneath a tree. The church is made out of a blue tarp hung over sticks. We sit on a combination of wooden pews and broken plastic lawn chairs. It is a small space, hot inside, but with the early morning sunlight shining through tears in the tarp, a slight breeze, and the sound of birds in the trees, it is peaceful. Children dressed in colorful patterned clothes sit on the dirt floor. Some of the girls, as young as elementary school children, have babies swaddled on their backs. They begin to pray out loud. One young woman closes her eyes and tilts her head back, fervently whispering her petitions to the sky. I can’t understand her, or any of them, but as the praying ends I hear, “Thank you, Lord, thank you, my father,” and I think, whoever told me South Sudan was a place of suffering had it wrong. These people are filled with the Spirit. They are blessed. But after the service, when we are mulling about beneath the leafy tree, Rachel, one of our team members, relates a story: one of the churchgoers, a 19-year-old woman without a husband, has just asked Rachel to take her baby back to the United States. Rachel suggests the mother would miss her daughter, but it is clear the mother realizes the life she can give her baby in South Sudan is not the life any mother would want for a child. There is sickness here, and little medication. There is poverty. There is war. There is death. A man comes up to our group and asks for a Bible. He says his name is John. He’s already drunk two two-liter bottles of beer that day. He is barefooted, wearing torn and dirty clothes, his eyes red and bleary, his breath rank. Before giving him a Bible, we ask why he wants it. He says God told him to read Psalm 31. We ask him if he believes in God, in Jesus. He says he knows who Jesus is, but does not believe in Him. There is shame and hurt in his eyes. John’s friend stands beside him, a friend who was formerly a drunk but changed after converting. This friend urges John to accept Christ, to give up drinking, but John does not want to. He says the drinking helps him forget his pain. When we ask what pain he wants to forget, he does not answer, but he does let us pray with him. He kneels on the ground as we place hands upon him. All I can do is whisper, over and over, the Jesus prayer, “Lord Jesus Christ, son of God, have mercy on this man, John, a sinner.” Why would John be so moved to speak with us, to ask for a Bible, to read a powerful verse like that? I am saddened at his state, the loneliness and hurt in his eyes, the inability to find peace. Before I came to South Sudan, many people who had been here before told me that South Sudan has the same darkness and light as the rest of the world, it is simply exaggerated. I think they are correct. There is joy and poverty in Dallas, too, but the joy of the South Sudanese against the stark poverty of their lives throws sin and grace in a bright light, revealing both our need for the Lord and His presence with us. You are currently reading Church beneath a tree at elizabeth hamilton.